This post includes affiliate links. By clicking on the link and making a purchase, My Urban Oven may receive a small commission. It was +55 degrees in Minnesota Sunday. We actually pulled out our grill, and didn’t wear jackets the weather was so warm! March in Minnesota normally is still pretty cold and snowy, so the warmer weather was every welcomed. The warmth also brought with it my itch to get my garden started. You know this itch is not new, but now that I can see ALL of the grass in our new backyard I am in full on research mode. I have been staring out at the backyard as many times a day as I can to see where the light hits different spots of the yard. I know this is futile because the sun in March vs. May are not at all similar. I suppose those pesky trees will have leaves on them come May, adding a whole new element to the shade vs sun analysis. Knowing all of this, I am still staring out at our backyard constantly! I even went out Sunday and started placing logs in different spots to see how much space I could take up in our backyard without going overboard. If you were able to catch it, I shared my thoughts on my Instagram Story. I have been adding to my Gardening Pinterest Board almost obsessively in the last few weeks. I think if I executed all my ideas it would take over our whole entire backyard. The Hubby may not like that idea, so I have been trying to scale back and narrow my mind set. 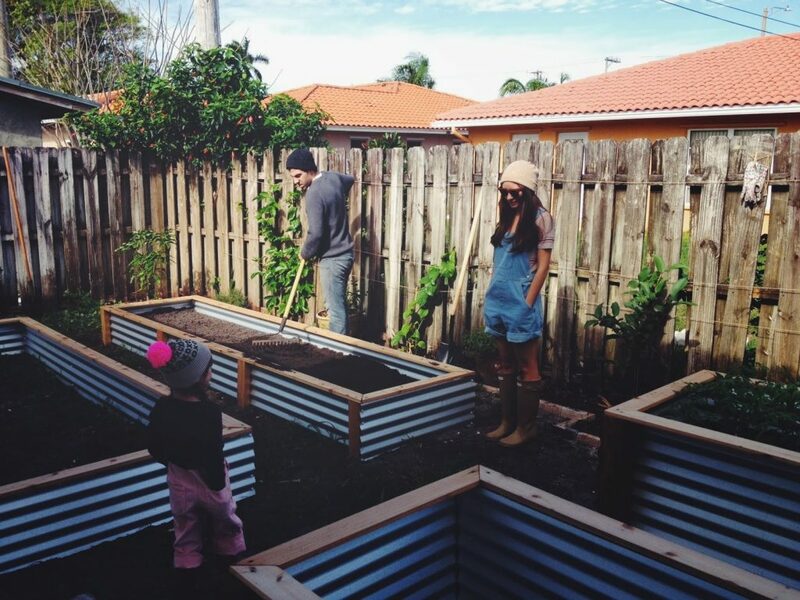 One thing I do know is that I want raised beds. I was up in the air for a while on if I wanted ground beds, raised beds, or even elevated raised beds. After doing more research, I much prefer the raised bed idea. Raised beds will help section off plants, contain plants, and will be easier on the budget than elevated raised beds. 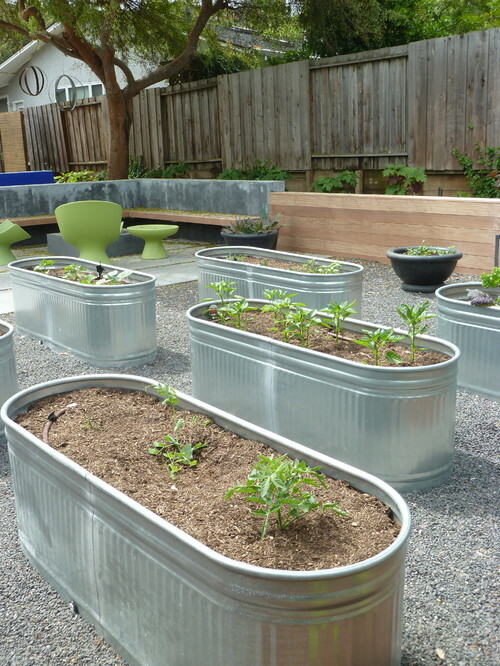 After doing some math on the price of lumber vs. the price of corrugated steel, I am leaning toward corrugated steel raised beds like the above ones made by Oh Dear Drea. I also really love the mix of metal and wood. The metal will help the garden pop out from its surroundings too. Being able to build path ways between plants is really high on my list as well. A ground bed could allow for path ways, but would take more to control. I love the idea of being able to “stroll through the garden”, even if the garden is going to be much smaller than those of Versailles. I would also like to incorporate something round or oval in my garden space. My mom has old water troughs in her garden she uses to plant Tomatoes. I think the rounded look of these troughs give another element for the eye to be drawn to, as well as they add to an eclectic look that I am planning for my garden space. One idea I love is making a garden space, that has an entrance gate. What I love about the one above is that it has a trellis built right into the sides. How cute would it be with vines of green beans or cucumbers filling it to the top? This gate would be like the entrance to some secret garden oasis. 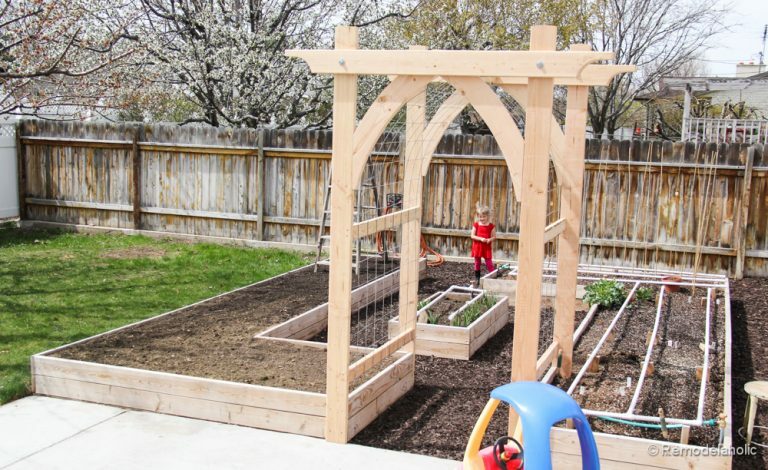 I do also love that the couple who made this lovely arbor also provided design instructions for building your own. Oh and don’t get me started on the rest of the yard. I keep trying to remind myself that I don’t have the time, nor the budget to overhaul the WHOLE yard this coming season. There will be phases to these projects, but my garden will be the first project as soon as the weather is warm enough and the ground soft enough. There is so much to consider, but I can’t wait to get started! As you start to think about your summer gardening, check out a few of my favorite tools to use for the garden. A Multiple Function Sprayer is as must for watering plants, cleaning containers and filling water containers. Having a small Tiller is great for turning over your garden each Spring; making the soil nice and fluffy. I also use the tiller to manage weeds. The compact size allows me to pop it in between plants and blast our weeds. Speedy way of weeding! Good Pruning Shears is a must for cleaning up shrubs, plants and gathering flowers. I always prefer Fiskars band products when buying cutting tools. They make a real quality item. I have had too many pairs of garden gloves that allowed water and dirt to get through leaving my hands dirty even though I had on gloves. After I found these Coated Gardening Gloves, and will not wear anything else. A garden stool and carrying bag is on my list of items to buy for this years gardening season. I am looking to buy this Stool & Tool Bag combo. Normally I carry everything around in a bucket, but having a stool built into the Tool Bag, is genius! If you have any shrubs in your yard, a Large Hedge Shears is needed in addition to the pruning shears. I used these to trim up all my bushes to make sure they don’t get out of control! Any set of good Garden Tools will do the trick, but I do prefer metal ones because they cut through the dirt easier and they hold up when cutting into tough ground. The thing I love about this set is that the Transplanter Trowel has measurements for when you are planting. Another must in the garden is a wide toothed Garden Rake. I use ours for cleaning up garden beds, smoothing out soil and preparing soil for planing. I know many of you may be starting to think about your summer gardens too. I would love to hear your thoughts on garden planning, any great ideas you have for what I should grow and any experiences you have had with raised bed gardening. I love raised beds!! I also feel like they are better on my back! Great tips! I have been looking to do a garden this year and this has been helpful! Gardening is the best! I will have more posts on my garden coming this Spring/Summer. Stop by to check them out! I so wish I could grow things – I just love the idea of an outdoor oasis with plants galore in charming pots and plots. We have so much shade that I’m going to have to live vicariously through you and others! I hope you get to your gardening soon! Our old house had alot if shade and I could never get a garden to grow. Looking forward to this year! Thanks for stopping by. keep coming back, I will be sharing more as the spring/summer goes along! Your backyard is my ultimate dream! How long did it take you to set everything up? We just bought our house, and the 3 images are from other blogs as inspiration. You can see the Source link to see their posts. The main image is my backyard, and the flowers were already planted. 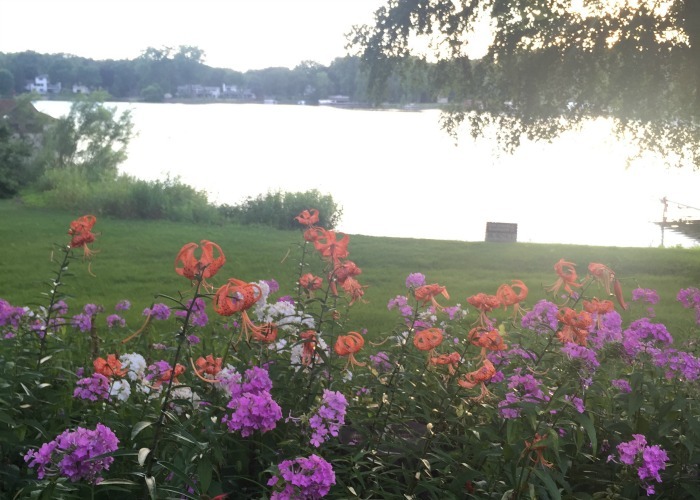 I am looking forward to adding all these ideas to my yard this year! Thanks for stopping by! 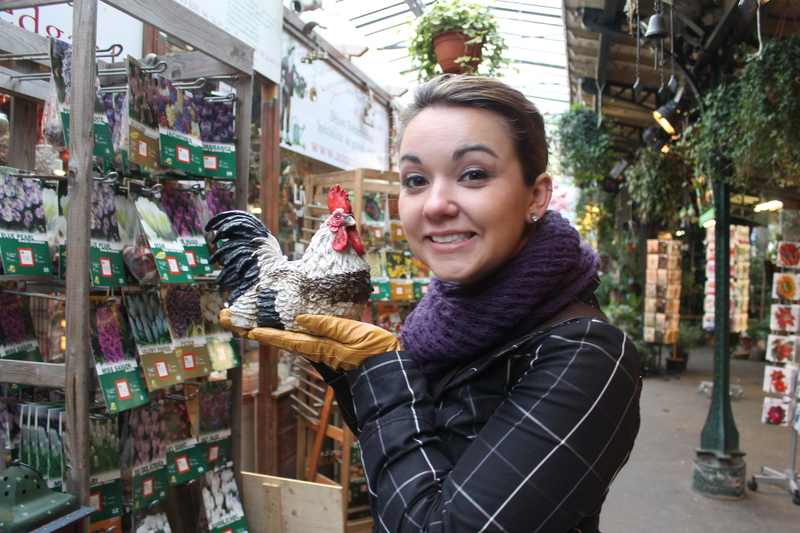 My friend was looking for water troughs like that…she’s a Gardner that must be why! GrEat idea! Gardeners think alike!! Glad I am not the only one thinking this would be a good idea 🙂 Thanks for stopping by! Still to early here to plant but we have started our seedlings and are cleaning up and doing more planning on where what will be planted. Can’t wait. You and I are in the same boat! I am working on getting my seedlings started this week 🙂 Best of luck on your garden this season! I love your raised beds inspiration! I need to do a better job planning the entire garden. Usually my thought process is just, “Hey, I want some [insert name of plant that I’ve suddenly decided I want to grow]! Uhmm…here’s a sunny spot. I’ll just throw a raised bed up right here.” It’s not the most aesthetically pleasing approach, ha! I totally understand where you were you coming from… that was me at our last house. Since we plan to be in this one for a lot longer, I thought I should be more planful this time. Let’s hope the planning works out! Good luck with your garden this season! I love these ideas. I started my garden with raised beds. When I went to extend my garden space, I decided not to do raised beds because they were so much work the first time around. But I feel like raised beds are so much easier to work in! Best of luck this season! I know, the idea of the work hopefully will way off in the long run. I might start smaller and keep adding over the years. My Hubby is worried I might take on too much this year. I am always ambitious! Best of luck with your season as well! I’m so excited for the gardening season. My plants are already started! I’m moving mid summer though so it will be interesting trying to figure out what to do with the plants. We moved last summer too, and I left my garden for the new owners. I also told the neighbor to pick anything they wanted while the house was on the market because we had already moved out. Sharing is caring!